Concert Update at Farm Aid 2004 concert. Matthews, Lucinda Williams, and Steve Earle are lined up for this year's Farm Aid concert in Auburn, WA, reports Union Man over on RUST. Kitty Jerry, Kate Voegele, and Tegan and Sara will also be on board. The concert is scheduled to be webcast, also. More on Farm Aid and the 2004 concert. 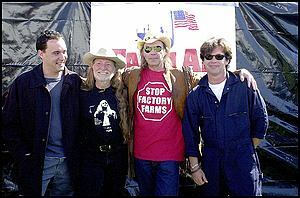 Also, here are some photos of Farm Aid 2003.